A charming bed and breakfast inn overlooks the picturesque vineyards of Indian Creek Village Winery & Village Inn in Ringwood. Indian Creek offers a romantic countryside escape with gourmet meals, wine tastings and peaceful surroundings. Immerse yourself in the rolling hills of Oklahoma’s wine country, raise a glass for a toast, and enjoy a sip of sublime relaxation during a visit to one of Oklahoma’s premier wineries and vineyards. Scattered throughout the state, these unexpected gems combine elegant tasting rooms, impeccable landscaping and friendly hospitality to produce a unique charm on their own – not to mention the incredible variety of flavorful wines they offer. Depending on the winery, you’re guaranteed to find a wide variety of reds such as shiraz and merlot, whites like chardonnay and pinot gris, fruit blends and more. Indulge your senses and tastebuds with a glass of wine at these wineries, and make sure to pick up a bottle of your favorite to take home. Set within the scenic beauty of southeastern Oklahoma near Broken Bow, Girls Gone Wine keeps the focus on fun. Bring a group of friends for an unforgettable, laughter-filled time while tasting signature wines, relaxing on the covered patio, or even bottling your own specialty blend. Savor a glass of Down Under Divas (a bold cabernet sauvignon) or Groovin’ (a delightful pinot grigio) in the tasting room, and then make your way into the on-site gift shop, where you can socialize and shop for unique accessories. To experience winemaking for yourself, Girls Gone Wine will help you craft your own batch of 30 bottles of wine – simply come back when the wine is ripe to bottle, cork and custom label your product! 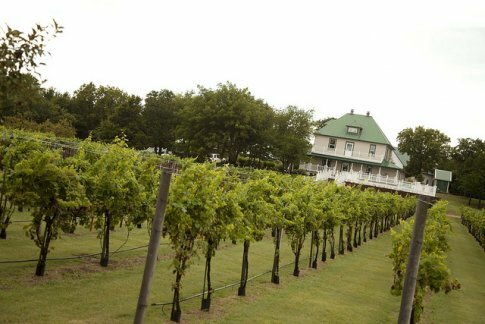 Immerse yourself in the beauty of Caddo County’s Woods & Waters Winery and Vineyard in Anadarko, the largest vineyard in Oklahoma that boasts over 600 acres of prime countryside, rolling hills and trees. Whether searching for a pitch-perfect shiraz or looking to satisfy your appetite with an inviting meal in the winery’s on-site bistro, Woods & Waters will accommodate your every need. Each wine produced at this Anadarko winery is crafted from the vineyard’s 11 varieties of Oklahoma-grown grapes. Order a scrumptious wine taster’s plate for fresh cheeses, fruits, nuts and crackers, and then pair your meal with a glass of red, white, rose or blush wine for a perfect afternoon. Stop into StableRidge Vineyards & Winery in Stroud to savor the delights of wine in a laid-back setting. The winery’s tasting room and gift shop are housed within a former Catholic church, originally built in 1902. Refurbished to showcase its original design, the building creates an inviting ambiance. Chill out on the inviting patio with a glass of chardonnay or merlot, or try one of the blends such as the Harmony, a white zinfandel blend, or the incredibly popular Jeremiah’s Red, a blend of reds with a touch of blackberry. At Indian Creek Village Winery & Village Inn in Ringwood, guests have the option to stop in for a glass of wine or to stay awhile in the enchanting bed and breakfast, which directly overlooks rows upon rows of the winery’s grapevines. Whether on a romantic getaway or day trip with friends, the warm hospitality at this winery and inn will whisk your worries away. Soak in the peaceful atmosphere of Indian Creek Village while sampling wines in the tasting room, and once you’ve chosen your favorite, explore the exquisitely-landscaped grounds with glass in hand. The winery’s selections include merlot, house blends and fruit wines from grapes grown in the extensive vineyards right outside the inn. Quench your thirst for premier Oklahoma wine at Sparks Vineyard & Winery. Nestled along 80 sprawling acres of Oklahoma countryside, this winery boasts a large selection of fine table wines and gift items. Relax in the winery’s cozy tasting room and spend some time perusing the original, Oklahoma art that adorns the walls. Enjoy a taste of Deep Ford Red or Village White, and don’t forget to take home a bottle of Sparks wine, winner of the People’s Choice Award in the Oklahoma State Wine Championship. Sparks Vineyard & Winery also bottles a variety of fruity and dessert wines, as well as sangria. A family farm turned winery and bed and breakfast awaits you at Plymouth Valley Cellars in Fairview. After you canvass the vineyard, head into the tasting room to explore the wines. Choose your favorite and let the host pour a glass just for you. From varietals such as Oklahoma riesling and zinfandel to cabernet doux and kiwi strawberry, the diverse flavors resonate with guests. Make your way to one of the outdoor tables to relax in the fresh air while sharing conversation, a bottle of vino and a gorgeous view of an Oklahoma sunset. Visitors are also invited to enjoy a country stay amidst the vineyard, or kick back for a mellow weekend at the Flaming homestead, a four-bedroom rental with a spacious deck and hot tub. Situated within central Oklahoma’s beautiful cross timbers region, Tres Suenos Vineyards & Winery in Luther offers free wine tastings, tours of the grounds and a relaxing, pine-covered picnic area. Take a glass of Tres Suenos’ Gold Medal Fiesta Blanca out onto the winery’s balcony overlooking the vineyard, or enjoy a tantalizing taste of Blush Delight within the beautifully appointed tasting room for an intoxicating blend of honeysuckle, citrus and peach. Tres Suenos also offers a variety of wines including zinfandel, shiraz, chardonnay, merlot, cabernet sauvignon and muscat, ensuring you won’t leave Tres Suenos empty handed.